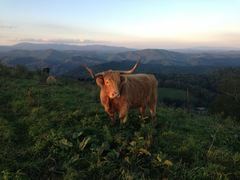 1) Bear Pen Farms - Highland Meadows Cattle Co.
We are a family owned and operated farm in Lansing NC. We breed and raise Scottish Highland Cattle for meat sales and breeding stock. Our beef is raised without antibiotics or added hormones, they are never put in feedlots or exposed to chemicals or pesticides. They free-range on our high elevation pastures and drink from clear clean mountain water. Simply known as Highland Cattle, these animals are instantly recognized by their sweeping horns and flowing hair. Highland cattle have been long known for the quality beef they produce which we sell by the cut, half or whole. Glimpse the daily operations of our family farm: dad checking beehives and extracting honey; mom and sister baking in the kitchen; boys gathering eggs and shiitake mushrooms; little folks playing outside and eating fresh fruit and produce in the garden. Zydeco Moon is named after the Cajun French name for green beans, from a song made famous by Clifton Chenier “Zydeco sont pas sale” or “the green beans have no salt”. We moved here from South Louisiana and wanted to bring a little of that culture with us to the mountains of Ashe County. Our farm was purchased from the DeBoard family in 2005. It had been out of production since 1960 when Uncle Kirk DeBoard died. 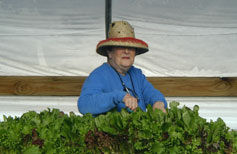 We began the long process of putting the farm back into production and became certified organic in 2006. Visitors to Zydeco Moon will tour our passive solar greenhouse, 3 high tunnels and our 11 fields along Helton Creek and our ridge above the Helton Creek. We will have our farm wagon hooked up for the guided tours, and if the weather cooperates, stops for wild berry picking on the way to the ridge fields. The kids are welcome to bring fishing poles and try their luck in Helton Creek, one of North Carolina’s premier delayed harvest trout streams. 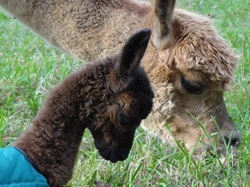 Land Farm Alpacas is a small working alpaca farm in the pristine mountains of Grassy Creek, NC. The alpacas are raised for their extremely warm and soft fiber that is sheared once a year in the spring. Much of the fiber is then processed into yarn (some hand spun and some mill processed), and made into socks, caps, scarves and other accessories and garments, including summer-weight socks! 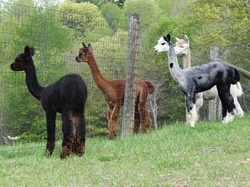 A variety of items made from alpaca are available for sale at the farm at the Paca Palace Fiber Shop! A self-guided walking tour includes informational posters, fleece exhibits, shearing photos, and demonstrations by fiber artists, including fiber carding, hand spinning, knitting and maybe some wet felting. You will see the process the fiber goes through from the alpaca to finished garment! After taking the tour, which should answer most of your questions, meet our alpacas up close and personal and ask the owners any questions not answered by the educational exhibits. Everything in the shop will be 10 percent off for the Farm Tour weekend only! We have a working goat dairy. Visitors will be able to interact with the goats, view the milking parlor, cheese processing room, cheese tasting, black-smith sho﻿p, and studio where broom-making, basket weaving, and hide tanning take place. 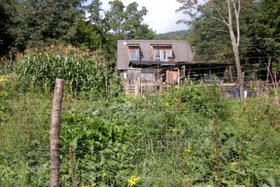 Woodland Harvest is a permaculture homestead with adults & children, animals, gardens, pond, and woodland habitat. Visit & learn how to live in sync with nature, grow your own food & medicine, make your own electricity with the power of mountain creeks, build your own infrastructure with forest & scavenged materials, & make positive social change in your community! We hope to see you for a tour of our homestead where we’ll have activities for children and refreshments of homegrown kombucha & farm fresh snacks! Come and see how we grow all year "in the gutters"! We are a USDA Certified Organic farm with specialty vegetables, herbs and 100% Honey. We will have these for sale as well as embroidered linen towels with quaint sayings from the mountains of NC.